Leviev, the world’s largest cutter and polisher of diamonds, has been linked to expanding Jewish-only settlements in the Palestinian West Bank and a sketchy human rights record in Angola, where it controls the diamond supply. 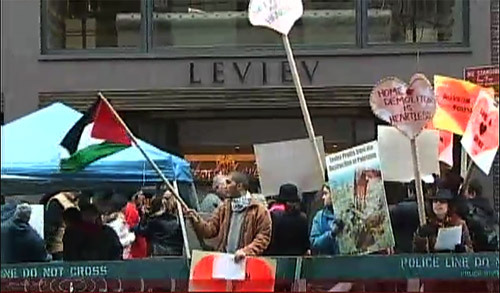 We speak to two Palestinian and Jewish members of Adalah-New York, a group that’s held weekly protests outside Leviev’s Madison Avenue store. 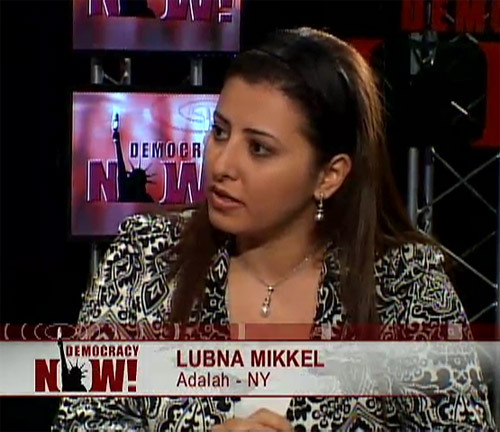 Lubna Mikkel, Palestinian lawyer and member of Adalah-New York. 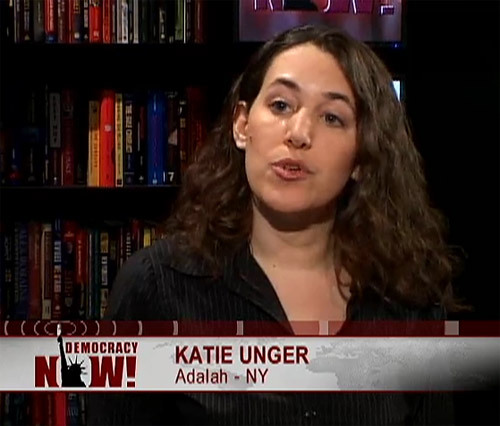 Katie Unger, Member of Adalah-New York and Jews Against the Occupation. 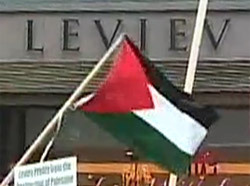 Leviev’s new Madison Avenue store in New York has been the target of almost weekly protests since it opened last November. 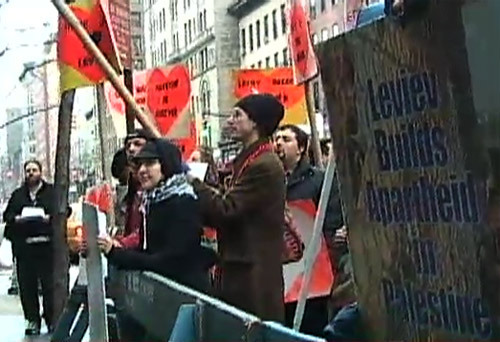 On Saturday, protesters in New York and London urged people not to shop at Leviev for Valentine’s Day. Those protesting Leviev allege that two of his companies and his former business partner, Brooklyn developer Shaya Boymelgreen, expanded at least five illegal Jewish-only settlements in the Palestinian West Bank. They also point to his sketchy human rights record in the African country of Angola, where Leviev controls the diamond supply. AMY GOODMAN: We invited a Leviev representative to join us on today’s broadcast, but they declined. They did send us a statement, however, saying: “Protests against LEVIEV and the Lev Leviev Group of Companies are politically motivated. Those who personally attack the companies or its founder deliberately neglect their extensive humanitarian and philanthropic work, which includes building schools, orphanages, and fostering economic development in communities around the world. “These protests are also inaccurate in their charges against LEVIEV diamonds. LEVIEV is a rigorous supporter of the UN mandated Kimberley Process concerning conflict-free diamonds and ensures that all gemstones—of all colors—are sourced through internationally recognized legal and ethical guidelines.” That, again, the statement of Leviev. 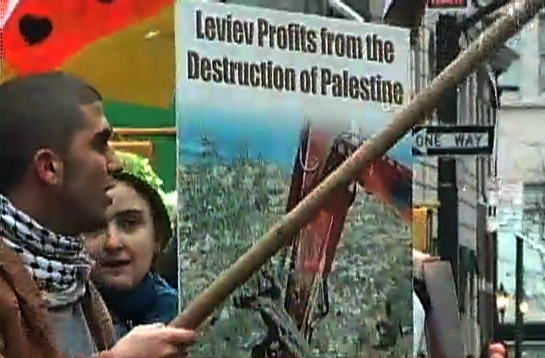 Adalah-New York, or the Coalition for Justice in the Middle East, is the group that’s been organizing the protests against Leviev in New York. We’re joined right here in the firehouse now by two members of Adalah. 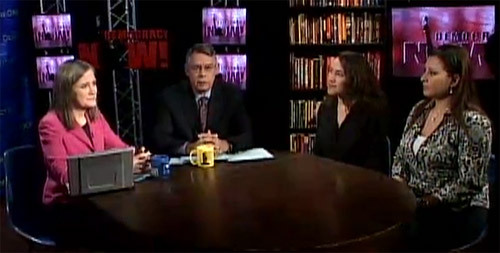 Lubna Mikkel is a Palestinian lawyer, and Katie Unger is with Jews Against the Occupation. We welcome you both to Democracy Now! Explain, Katie, these protests, why you’re focusing on Leviev. KATIE UNGER: Well, Lev Leviev is an Israeli billionaire who just recently opened his first New York retail establishment, and after Palestinians, who have been struggling nonviolently against the wall and against the seizure of their land in places like Jayyous and Bil’in, pointed Lev Leviev and Shaya Boymelgreen out, as they had become aware that these two individuals were people who were responsible for the destruction of their communities, the seizure of their land, the impoverishment of their people. And when we learned that Lev Leviev was opening a jewelry store on Madison Avenue, we decided to let him know that New Yorkers, who are committed to human rights, don’t accept his participation in our city, don’t accept him making more money off of us. 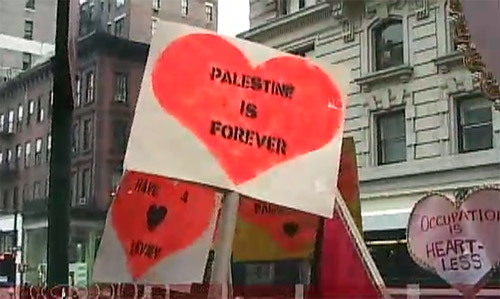 "Leviev profits from the destruction of Palestine"
JUAN GONZALEZ: And, Lubna Mikkel, in terms of the work that he has done in the Occupied Territories, can you talk about that? LUBNA MIKKEL: Well, he is engaged in real estate development, which means, for Palestinians, more settlements, more illegal Jewish-only settlements, especially in Mattiyahu East on the lands of Bil’in, which is a village that has been doing nonviolent demonstrations for the last three years against the wall, the apartheid wall built on its land, confiscating 50 percent of its farming land. And he’s also involved in—I mean, he’s—most of the Zufim settlement on the lands of Jayyous was constructed by Leviev. The same—more units are being built now in Har Homa, in Jabal Abu Ghneim, are built by Leviev. He’s also involved in Maale Adumim in East Jerusalem. These blocks, these settlements, basically divide Palestinian communities into bantustans. So we’re not connected anymore. More, he is also involved—he owns about a quarter of the shares of Dor Energy, or Dor alone, which is the monopoly supplier or provider of fuel to the Gaza Strip. And just a few weeks back in December, or a few months back, in December, they cut fuel supply by 75 percent, although the Israeli army called for a 12 percent—five to 12 percent cut. JUAN GONZALEZ: Now, Leviev has also been involved in Angola early on in diamond production there. Could you talk about that, as well? KATIE UNGER: Lev Leviev, through a very close relationship with the Dos Santos regime in Angola, has a monopoly on Angolan diamonds. And so, one of the things that’s so disingenuous about pointing to the Kimberley Process is that the Kimberley Process only refers to conflict diamonds defined as those diamonds that are involved in rebellions against recognized governments. It has nothing to say about recognized regimes, like repressive dictatorships like the Angolan regime. It has nothing to say about the conditions that diamonds are being mined under and processed under and delivered under, under any form of regime. And Leviev has profited immensely off of this relationship with the dictator and off of the oppression of the Angolan people. And human rights activists and journalists in Angola have pointed to the humiliation, whipping and other terrible conditions by the security companies that Lev Leviev’s interests in Angola are paying. 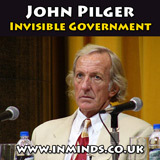 AMY GOODMAN: So what are you calling for right now, Lubna Mikkel? LUBNA MIKKEL: Well, we’re basically calling for a boycott of Leviev and his jewelry store and his businesses in New York City. We’re basically aiming at educating and raising the awareness of New Yorkers of the human rights violations, of the wide spectrum of human rights violations that Leviev and Shaya Boymelgreen are involved in. And we’re calling for their—we’re calling on Leviev and Shaya Boymelgreen to end their construction of the settlements immediately. "Leviev Builds Apartheid in Palestine"
AMY GOODMAN: I’m looking at New York Magazine. They did a profile on Lev Leviev. He just bought the old New York Times building—right?—massive structure in midtown Manhattan, owns Africa-Israel—that’s what his company is called, which owns 1,700 Fina gas stations, describes itself as the country’s largest 7-Eleven franchisee. Also, in talking about the issue of Angola and the diamonds, New York Magazine said that Leviev’s alliance with the government led to his gaining primary control of the country’s rough diamond supply since 2000. A security company contracted by Leviev was accused this year by a local human rights monitor of participating in practices of humiliation, whipping, torture, sexual abuse and, in some cases, assassinations. Leviev’s formal response to the report did not directly address the abuses but touted his charitable activities in Angola. Finally, Katie Unger, on that issue of diamonds in Angola and what you are demanding of Leviev there? KATIE UNGER: One of the things about Leviev and one of the reasons why these protests outside Leviev have caught such international attention is that they bring together atrocities around the world. And so, in addition to calling on Leviev to end his settlement construction and end his problematic building practices in New York, we are calling on Leviev to ensure human rights in his diamond [inaudible], and we’re supporting Angolan human rights activists who are calling for free elections and improved conditions in diamond mines there. AMY GOODMAN: Well, we want to thank you both very much for being with us. Katie Unger is part of the coalition of groups that are having protests outside Leviev. She’s a member of Adalah-New York and Jews Against the Occupation. Lubna Mikkel, Palestinian lawyer, a member of Adalah-New York, as well. Thank you for joining us.